Dialectical behavior therapy (DBT) is an evidence-based psychotherapy that began with efforts to treat Borderline Personality Disorder (preferably known as Emotional Instability Disorder). DBT has been proven useful in treating mood disorders, suicidal ideation, and for change in behavioral patterns such as self-harm, and substance abuse. DBT evolved into process in which the therapist and client work with acceptance and change-oriented strategies, and ultimately balance and synthesize them, in a manner comparable to the philosophical dialectical process of hypothesis and antithesis, followed by synthesis. This approach is designed to help people increase their emotional and cognitive regulation by learning about the triggers that lead to reactive states and helping to assess which coping skills to apply in the sequence of events, thoughts, feelings, and behaviors to help avoid undesired reactions. A modified form of cognitive behavioral therapy (CBT), DBT was developed in the late 1980s by Marsha M. Linehan, a psychology researcher at the University of Washington, to treat people with borderline personality disorder and chronically suicidal individuals. Research on its effectiveness in treating other conditions has been fruitful; DBT has been used to treat people with depression, drug and alcohol problems, post-traumatic stress disorder (PTSD), traumatic brain injuries (TBI), binge-eating disorder, and mood disorders. Research indicates DBT might help patients with symptoms and behaviors associated with spectrum mood disorders, including self-injury. Recent work also suggests its effectiveness with sexual abuse survivors and chemical dependency. 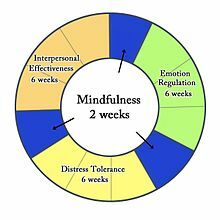 DBT combines standard cognitive behavioral techniques for emotion regulation and reality-testing with concepts of distress tolerance, acceptance, and mindful awareness largely derived from Buddhist meditative practice. DBT is based upon the biosocial theory of mental illness and is the first therapy that has been experimentally demonstrated to be generally effective in treating BPD. The first randomized clinical trial of DBT showed reduced rates of suicidal gestures, psychiatric hospitalizations, and treatment drop-outs when compared to treatment as usual. A meta-analysis found that DBT reached moderate effects in individuals with borderline personality disorder. Linehan observed "burn-out" in therapists after coping with "non-motivated" patients who repudiated cooperation in successful treatment. Her first core insight was to recognize that the chronically suicidal patients she studied had been raised in profoundly invalidating environments, and, therefore, required a climate of loving-kindness and somewhat unconditional acceptance (not Carl Rogers' positive humanist approach, but Thích Nhất Hạnh's metaphysically neutral one), in which to develop a successful therapeutic alliance. [note 1] Her second insight involved the need for a commensurate commitment from patients, who needed to be willing to accept their dire level of emotional dysfunction. DBT strives to have the patient view the therapist as an ally rather than an adversary in the treatment of psychological issues. Accordingly, the therapist aims to accept and validate the client's feelings at any given time, while, nonetheless, informing the client that some feelings and behaviors are maladaptive, and showing them better alternatives. DBT focuses on the client acquiring new skills and changing their behaviors, with the ultimate goal of achieving a "life worth living", as defined by the patient. In DBT's biosocial theory of BPD, clients have a biological predisposition for emotional dysregulation, and their social environment validates maladaptive behavior. Linehan and others combined a commitment to the core conditions of acceptance and change through the principle of dialectics (in which thesis and antithesis are synthesized) and assembled an array of skills for emotional self-regulation drawn from Western psychological traditions, such as cognitive behavioral therapy and an interpersonal variant, "assertiveness training", and Eastern meditative traditions, such as Buddhist mindfulness meditation. One of her contributions was to alter the adversarial nature of the therapist-client relationship in favor of an alliance based on intersubjective tough love. Group – A group ordinarily meets once weekly for two to two and a half hours and learns to use specific skills that are broken down into four skill modules: core mindfulness, interpersonal effectiveness, emotion regulation, and distress tolerance. No one component is used by itself; the individual component is considered necessary to keep suicidal urges or uncontrolled emotional issues from disrupting group sessions, while the group sessions teach the skills unique to DBT, and also provide practice with regulating emotions and behavior in a social context. DBT skills training alone is being used to address treatment goals in some clinical settings, and the broader goal of emotion regulation that is seen in DBT has allowed it to be used in new settings, for example, supporting parenting. A diagram used in DBT, showing that the Wise Mind is the overlap of the emotional mind and the reasonable mind. Mindfulness is one of the core ideas behind all elements of DBT. It is considered a foundation for the other skills taught in DBT, because it helps individuals accept and tolerate the powerful emotions they may feel when challenging their habits or exposing themselves to upsetting situations. The concept of mindfulness and the meditative exercises used to teach it are derived from traditional Buddhist practice, though the version taught in DBT does not involve any religious or metaphysical concepts. Within DBT it is the capacity to pay attention, nonjudgmentally, to the present moment; about living in the moment, experiencing one's emotions and senses fully, yet with perspective. The practice of mindfulness can also be intended to make people more aware of their environments through their 5 senses: touch, smell, sight, taste, and sound. Mindfulness relies heavily on the principle of acceptance, sometimes referred to as "radical acceptance". Acceptance skills rely on the patient’s ability to view situations with no judgment, and to accept situations and their accompanying emotions. This causes less distress overall, which can result in reduced discomfort and symptomology. The first few sessions of DBT introduce the dialectic of acceptance and change. The patient must first become comfortable with the idea of therapy; once the patient and therapist have established a trusting relationship, DBT techniques can flourish. An essential part of learning acceptance is to first grasp the idea of radical acceptance: radical acceptance embraces the idea that one should face situations, both positive and negative, without judgment. Acceptance also incorporates mindfulness and emotional regulation skills, which depend on the idea of radical acceptance. These skills, specifically, are what set DBT apart from other therapies. Often, after a patient becomes familiar with the idea of acceptance, they will accompany it with change. DBT has five specific states of change which the therapist will review with the patient: precontemplation, contemplation, preparation, action, and maintenance. Precontemplation is the first stage, in which the patient is completely unaware of their problem. In the second stage, contemplation, the patient realizes the reality of their illness: this is not an action, but a realization. It is not until the third stage, preparation, that the patient is likely to take action, and prepares to move forward. This could be as simple as researching or contacting therapists. Finally, in stage 4, the patient takes action and receives treatment. In the final stage, maintenance, the patient must strengthen their change in order to prevent relapse. After grasping acceptance and change, a patient can fully advance to mindfulness techniques. This is used to nonjudgmentally observe one's environment within or outside oneself. It is helpful in understanding what is going on in any given situation. DBT recommends developing a "teflon mind", the ability to let feelings and experiences pass without sticking in the mind. This is used to express what one has observed with the observe skill. It is to be used without judgmental statements. This helps with letting others know what one has observed. Once the environment or inner state of mind has been observed with 5 senses, the individual can put words to observations and thus better understand the environment. How to do Mindful Meditation. There are many "scripted" meditations available on YouTube; for example: The 3 Minute Meditation; or The Body Scan. How to do it (The Body Scan): You listen to the body scan and you allow your mind to focus on each aspect of your physical self, usually starting at your toes and ending at the top of your head. As you listen to the body scan and allow your mind to focus in on the body, you will notice your "busy mind" will come into consciousness. You will notice that thoughts and feelings will attempt to distract you from focusing on each part of your body. You will notice that some of the thoughts and feelings may be distressing to you. You may want to stop the meditation because it might be very painful emotionally or physically or because you are having negative or busy thoughts. Sometimes memories may surface and they may also be difficult emotionally to accept. How to do Mindful Meditation involves learning to acknowledge the thoughts, feelings and memories without needing to fight them or chase them away. The paradox: If we try to fight them, they seem to get bigger; but when we move into acceptance, they seem to get smaller. We enter the mindfulness meditation body scan, 3 minute meditation or other meditation sessions with no goals and with a non-striving stance. Again, if we enter with a goal to "fix my problems by meditating", that goal and pressure to fix something tends to make the problems bigger. To enter the meditation with a non-goal/non-striving attitude, so having no expectations, paradoxically, usually results in a reduction of stress, pain and other symptoms. This is the action of describing the facts, and not thinking in terms of "good" or "bad," "fair," or "unfair." These are judgments, not factual descriptions. Being nonjudgmental helps you to get your point across in an effective manner without adding a judgment that someone else might disagree with. This is used to focus on one thing. One-mindfully is helpful in keeping one's mind from straying into "emotion" by a lack of focus. Many current approaches to mental health treatment focus on changing distressing events and circumstances such as dealing with the death of a loved one, loss of a job, serious illness, terrorist attacks and other traumatic events. They have paid little attention to accepting, finding meaning for, and tolerating distress. This task has generally been tackled by person-centered, psychodynamic, psychoanalytic, gestalt, or narrative therapies, along with religious and spiritual communities and leaders. Dialectical behavior therapy emphasizes learning to bear pain skillfully. Activities – Use positive activities that you enjoy. Contribute – Help out others or your community. Comparisons – Compare yourself either to people that are less fortunate or to how you used to be when you were in a worse state. Emotions (other) – cause yourself to feel something different by provoking your sense of humor or happiness with corresponding activities. Push away – Put your situation on the back-burner for a while. Put something else temporarily first in your mind. Imagery – Imagine relaxing scenes, things going well, or other things that please you. Meaning – Find some purpose or meaning in what you are feeling. Prayer – Either pray to whomever you worship, or, if not religious, chant a personal mantra. Relaxation – Relax your muscles, breathe deeply; use with self-soothing. One thing in the moment – Focus your entire attention on what you are doing right now. Keep yourself in the present. Vacation (brief) – Take a break from it all for a short period of time. Encouragement – Cheerlead yourself. Tell yourself you can make it through this and cope as it will assist your resilience and reduce your vulnerability. Learning how to understand and name emotions: the patient focuses on recognizing their feelings. This segment relates directly to mindfulness, which also exposes a patient to their emotions. Changing unwanted emotions: the therapist emphasizes the use of opposite-reactions, fact-checking, and problem solving to regulate emotions. While using opposite-reactions, the patient targets distressing feelings by responding with the opposite emotion. Reducing vulnerability: the patient learns to accumulate positive emotions and to plan coping mechanisms in advance, in order to better handle difficult experiences in the future. Managing extreme conditions: the patient focuses on incorporating their use of mindfulness skills to their current emotions, in order to remain stable and alert in a crisis situation. This skill concerns ineffective health habits that can make one more vulnerable to emotion mind. This skill is used to maintain a healthy body, so one is more likely to have healthy emotions. PhysicaL illness (treat) – If you are sick or injured, get proper treatment for it. Eating (balanced) – Make sure you eat a proper healthy diet, and eat in moderation. Avoid mood-altering drugs – Do not take other non-prescribed medication or drugs. They may be very harmful to your body, and can make your mood unpredictable. Sleep (balanced) – Do not sleep too much or too little. Eight hours of sleep is recommended per night for the average adult. Exercise – Make sure you get an effective amount of exercise, as this will both improve body image and release endorphins, making you happier. This skill is used when you have an unjustified emotion, one that doesn't belong in the situation at hand. You use it by doing the opposite of your urges in the moment. It is a tool to bring you out of an unwanted or unjustified emotion by replacing it with the emotion that is opposite. The interpersonal effectiveness module focuses on situations where the objective is to change something (e.g., requesting that someone do something) or to resist changes someone else is trying to make (e.g., saying no). The skills taught are intended to maximize the chances that a person's goals in a specific situation will be met, while at the same time not damaging either the relationship or the person's self-respect. This acronym is used to aid one in getting what one wants when asking. Describe one's situation using specific factual statements about a recent situation. Express the emotions experienced when the situation occurred, why this is an issue and how one feels about it. Assert one's self by asking clearly and specifically for what behavior change the person seeks. Reinforce one's position by offering a positive consequence if one were to get what one wants. Mindful of the situation by focusing on what one wants and disregard distractions through validation/empathy and redirecting back to the point. Appear confident and assertive, even if one doesn't feel confident. Negotiate with a hesitant person and come to a comfortable compromise on one's request. This skill set aids one maintaining one's relationships, whether they are with friends, co-workers, family, romantic partners, etc. It is to be used in conversations. Gentle: Use appropriate language, no verbal or physical attacks, no put downs, avoid sarcasm unless one is sure the person is alright with it, and be courteous and non-judgmental. Interested: When the person one is speaking to is talking about something, act interested in what is being said. Maintain eye contact, ask questions, etc. Avoid the use of a cell phone during an in-person conversation. Validate: Show understanding and sympathy of a person's situation. Validation can be shown through words, body language and/or facial expressions. Easy Manner: Be calm and comfortable during conversation; use humor; smile. This is a skill to aid one in maintaining one's self-respect. It is to be used in combination with the other interpersonal effectiveness skills. Fair: Be fair to both oneself and the other person. Apologies (few): Don't apologize more than once for what one has done ineffectively or for something that was ineffective. Stick to One's Values: Stay true to what one believes in and stand by it. Don't allow others to encourage action against one's own values. Truthful: Don't lie. Lying can only pile up and damage relationships and one's self-respect. Specially formatted cards track relevant emotions and behaviors. Diary cards are most useful when they are filled out daily. Thorough instructions are on Youtube. Exposure to Complex trauma, or the experience of traumatic events, can lead to the development of Complex Posttraumatic Stress Disorder (CPTSD) in an individual. CPTSD is a concept which divides the psychological community. The American Psychological Association (APA) does not recognize it in the DSM-5 (Diagnostical and Statistical Manual of Mental Disorders, the manual used by providers to diagnose, treat and discuss mental illness), though some practitioners argue that CPTSD is separate from Posttraumatic Stress Disorder(PTSD). CPTSD is similar to PTSD in that its symptomatology is pervasive and includes cognitive, emotional, and biological domains, among others. CPTSD differs from PTSD in that it is believed to originate in childhood interpersonal trauma, or chronic childhood stress, and that the most common precedents are sexual traumas. Currently, the prevalence rate for CPTSD is an estimated .5%, while PTSD's is 1.5%. Numerous definitions for CPTSD exist. Different versions are contributed by the World Health Organization (WHO), The International Society for Traumatic Stress Studies (ISTSS), and individual clinicians and researchers. Most definitions revolve around criteria for PTSD with the addition of several other domains. While The APA may not recognize CPTSD, the WHO has recognized this syndrome in its 11th edition of the International Classification of Diseases (ICD-11). The WHO defines CPTSD as a disorder following a single or multiple events which cause the individual to feel stressed or trapped, characterized by low self-esteem, interpersonal deficits, and deficits in affect regulation. These deficits in affect regulation, among other symptoms are a reason why CPTSD is sometimes compared with Borderline Personality Disorder (BPD). In addition to affect dysregulation, case studies reveal that patients with CPTSD can also exhibit Splitting, mood swings, and fears of abandonment. Like patients with Borderline Personality Disorder, patients with CPTSD were traumatized frequently and/or early in their development and never learned proper coping mechanisms. These individuals may use avoidance, substances, dissociation, and other maladaptive behaviors to cope. Thus, treatment for CPTSD involves stabilizing and teaching successful coping behaviors, affect regulation, and creating and maintaining interpersonal connections. In addition to sharing symptom presentations, CPTSD and BPD can share neurophysiological similarities. For example, abnormal volume of the amygdala (emotional memory), hippocampus (memory), anterior cingulate cortex (emotion), and orbital prefrontal cortex (personality). Another shared characteristic between CPTSD and BPD is the possibility for dissociation. Further research is needed to determine the reliability of dissociation as a hallmark of CPTSD, however it is a possible symptom. Because of the two disorders’ shared symptomatology and physiological correlates, psychologists began hypothesizing that a treatment which was effective for one disorder may be effective for the other as well. DBT’s use of acceptance and goal orientation as an approach to behavior change can help to instill empowerment and engage individuals in the therapeutic process. The focus on the future and change can help to prevent the individual from becoming from overwhelmed by their history of trauma. This is a risk especially with CPTSD, as multiple traumas are common within this diagnosis. Generally, care providers address a client’s suicidality before moving on to other aspects of treatment. Because PTSD can make an individual more likely to experience suicidal ideation, DBT can be an option to stabilize suicidality and aid in other treatment modalities. Some critics argue that while DBT can be used to treat CPTSD, it is not significantly more effective than standard PTSD treatments. Further, this argument posits that DBT decreases self-injurious behaviors (such as cutting or burning) and increases interpersonal functioning but neglects core CPTSD symptoms such as impulsivity, cognitive schemas (repetitive, negative thoughts), and emotions such as guilt and shame. The ISTSS reports that CPTSD requires treatment which differs from typical PTSD treatment, using a multiphase model of recovery, rather than focusing on traumatic memories. The recommended multiphase model consists of establishing safety, distress tolerance, and social relations. Because DBT has four modules which generally align with these guidelines (Mindfulness, Distress Tolerance, Affect Regulation, Interpersonal Skills) it is a treatment option. Other critiques of DBT discuss the time required for the therapy to be effective. Individuals seeking DBT may not be able to commit to the individual and group sessions required, or their insurance may not cover every session. Approximately 56% of individuals diagnosed with Borderline Personality Disorder also meet criteria for PTSD. Because of the correlation between Borderline Personality Disorder traits and trauma, some settings began using DBT as a treatment for traumatic symptoms. Some providers opt to combine DBT with other PTSD interventions, such as Prolonged Exposure Therapy (PE) (repeated, detailed description of the trauma in a psychotherapy session) or Cognitive Processing Therapy (CPT) (psychotherapy which addresses cognitive schemas related to traumatic memories). For example, a regimen which combined PE and DBT would include teaching mindfulness skills and distress tolerance skills, then implementing PE. The individual with the disorder would then be taught acceptance of a trauma's occurrence and how it may continue to affect them throughout their lives. Participants of clinical trials such as these exhibited a decrease in symptoms, and throughout the 12-week trial, no self-injurious or suicidal behaviors were reported. Another argument which supports the use of DBT as a treatment for trauma hinges upon PTSD symptoms such as emotion regulation and distress. Some PTSD treatments such as exposure therapy may not be suitable for individuals whose distress tolerance and/or emotion regulation is low. Biosocial theory posits that emotion dysregulation is caused by an individual’s heightened emotional sensitivity combined with environmental factors (such as invalidation of emotions, continued abuse/trauma), and tendency to ruminate (repeatedly think about a negative event and how the outcome could have been changed). An individual who has these features is likely to use maladaptive coping behaviors. DBT can be appropriate in these cases because it teaches appropriate coping skills and allows the individuals to develop some degree of self-sufficiency. The first three modules of DBT increase distress tolerance and emotion regulation skills in the individual, paving the way for work on symptoms such as intrusions, self-esteem deficiency, and interpersonal relations. Noteworthy is that DBT has often been modified based on the population being treated. For example, in veteran populations DBT is modified to include exposure exercises and accommodate the presence of traumatic brain injury (TBI), and insurance coverage (ie shortening treatment). Populations with comorbid BPD may need to spend longer in the “Establishing Safety” phase. In adolescent populations, the skills training aspect of DBT has elicited significant improvement in emotion regulation and ability to express emotion appropriately. In populations with comorbid substance abuse, adaptations may be made on a case-by-case basis. For example, a provider may wish to incorporate elements of Motivational Interviewing (psychotherapy which uses empowerment to inspire behavior change). The degree of substance abuse should also be considered. For some individuals, substance use is the only coping behavior they know, and as such the provider may seek to implement skills training before target substance reduction. Inversely, a client’s substance abuse may be interfering with attendance or other treatment compliance and the provider may choose to address the substance use before implementing DBT for the trauma. ^ Described by Thích Nhất Hạnh in his second moral precept of Zen Buddhism as loving kindness. ^ a b Chapman, AL (2006). "Dialectical behavior therapy: current indications and unique elements". Psychiatry (Edgmont). 3 (9): 62–8. PMC 2963469. PMID 20975829. ^ "An Overview of Dialectical Behavior Therapy – Psych Central". 17 May 2016. Retrieved 2015-01-19. ^ "What is DBT?". The Linehan Institute. Retrieved 2015-08-29. ^ a b c d e f Linehan, Marsha M. (2014). "DBT Skills Training Manual" (PDF). www.guilford.com (2nd ed.). Guilford Press. Retrieved 11 December 2016. ^ Dimeff, LA; Linehan, MM (2008). "Dialectical behavior therapy for substance abusers". Addict Sci Clin Pract. 4 (2): 39–47. doi:10.1151/ascp084239. PMC 2797106. PMID 18497717. ^ "What is Dialectical Behavior Therapy (DBT)? – Behavioral Tech". behavioraltech.org. ^ Janowsky, David S. (1999). Psychotherapy indications and outcomes. Washington, DC: American Psychiatric Press. p. 100. ISBN 978-0-88048-761-0. ^ a b c Linehan, M. M.; Dimeff, L. (2001). "Dialectical Behavior Therapy in a nutshell" (PDF). The California Psychologist. 34: 10–13. ^ Brody, J. E. (2008, May 6). The growing wave of teenage self-harm. New York Times. Retrieved July 1, 2008. ^ Decker, S.E. ; Naugle, A.E. (2008). "DBT for Sexual Abuse Survivors: Current Status and Future Directions" (PDF). Journal of Behavior Analysis of Offender and Victim: Treatment and Prevention. 1 (4): 52–69. doi:10.1037/h0100456. Archived from the original (PDF) on 2010-12-29. ^ Linehan, Marsha M.; Schmidt, Henry III; Dimeff, Linda A.; Craft, J. Christopher; Kanter, Jonathan; Comtois, Katherine A. (1999). "Dialectical Behavior Therapy for Patients with Borderline Personality Disorder and Drug-Dependence" (PDF). The American Journal on Addictions. pp. 279–292. Retrieved 2014-03-31. ^ Linehan, M. M.; Armstrong, H. E.; Suarez, A.; Allmon, D.; Heard, H. L. (1991). "Cognitive-behavioral treatment of chronically parasuicidal borderline patients". Archives of General Psychiatry. 48 (12): 1060–64. doi:10.1001/archpsyc.1991.01810360024003. ^ Linehan, M. M.; Heard, H. L.; Armstrong, H. E. (1993). "Naturalistic follow-up of a behavioural treatment of chronically parasuicidal borderline patients". Archives of General Psychiatry. 50 (12): 971–974. doi:10.1001/archpsyc.1993.01820240055007. PMID 8250683. ^ Kliem, S.; Kröger, C. & Kossfelder, J. (2010). "Dialectical behavior therapy for borderline personality disorder: A meta-analysis using mixed-effects modeling". Journal of Consulting and Clinical Psychology. 78 (6): 936–951. CiteSeerX 10.1.1.456.8102. doi:10.1037/a0021015. PMID 21114345. ^ Choi-Kain, Lois W.; Finch, Ellen F.; Masland, Sara R.; Jenkins, James A.; Unruh, Brandon T. (3 February 2017). "What Works in the Treatment of Borderline Personality Disorder". Current Behavioral Neuroscience Reports. 4 (1): 21–30. doi:10.1007/s40473-017-0103-z. PMC 5340835. PMID 28331780. ^ "What is Dialectical Behavior Therapy (DBT)?". Behavioral Tech. Retrieved 30 November 2017. ^ Little, Hannah; Tickle, Anna; das Nair, Roshan (16 October 2017). "Process and impact of dialectical behaviour therapy: A systematic review of perceptions of clients with a diagnosis of borderline personality disorder" (PDF). Psychology and Psychotherapy: Theory, Research and Practice. 91 (3): 278–301. doi:10.1111/papt.12156. PMID 29034599. ^ Valentine, Sarah E.; Bankoff, Sarah M.; Poulin, Renée M.; Reidler, Esther B.; Pantalone, David W. (January 2015). "The Use of Dialectical Behavior Therapy Skills Training as Stand-Alone Treatment: A Systematic Review of the Treatment Outcome Literature". Journal of Clinical Psychology. 71 (1): 1–20. doi:10.1002/jclp.22114. PMID 25042066. ^ Zalewski, Maureen; Lewis, Jennifer K; Martin, Christina Gamache (June 2018). "Identifying novel applications of dialectical behavior therapy: considering emotion regulation and parenting". Current Opinion in Psychology. 21: 122–126. doi:10.1016/j.copsyc.2018.02.013. PMID 29529427. ^ "What is Mindfulness? – The Linehan Institute". www.linehaninstitute.org. Retrieved 2017-09-21. ^ Linehan, Marsha M. (2014). "DBT Skills Training Manual" (PDF). www.guilford.com (2nd ed.). Guilford Press. Retrieved 11 December 2016. ^ Ellen., Astrachan-Fletcher (2009). The dialectical behavior therapy skills workbook for bulimia using DBT to break the cycle and regain control of your life. New Harbinger Publications. ISBN 9781608822560. OCLC 955646721. ^ "Core Mindfulness in Dialectical Behavior Therapy". GoodTherapy.org Therapy Blog. 2013-02-15. Retrieved 2017-09-21. ^ a b c d e f g h i j k l m n o p q Lisa Dietz (2003). "DBT Skills List". Retrieved 2010-04-26. ^ ""Road To Resiliance" Article: What is resilience?". American Psychological Association. ^ Stone, M.H. (1987) In A. Tasman, R. E. Hales, & A. J. Frances (eds. ), American Psychiatric Press review of psychiatry (vol. 8, pp. 103–122). Washington DC: American Psychiatric Press. ^ Holmes, P.; Georgescu, S. & Liles, W. (2005). "Further delineating the applicability of acceptance and change to private responses: The example of dialectical behavior therapy" (PDF). The Behavior Analyst Today. 7 (3): 301–311. ^ Sampl, S.; Wakai, S.; Trestman, R. & Keeney, E.M. (2008). "Functional Analysis of Behavior in Corrections: Empowering Inmates in Skills Training Groups" (PDF). Journal of Behavior Analysis of Offender and Victim: Treatment and Prevention. 1 (4): 42–51. doi:10.1037/h0100455. ^ "Self Awareness and Insight Through Dialectical Behavior Therapy: The Chain Analysis". www.parkslopetherapy.net. ^ Stoffers, JM; Völlm, BA; Rücker, G; Timmer, A; Huband, N; Lieb, K (15 August 2012). "Psychological therapies for people with borderline personality disorder" (PDF). The Cochrane Database of Systematic Reviews. 8 (8): CD005652. doi:10.1002/14651858.CD005652.pub2. PMID 22895952. ^ McMain, Shelley (1 December 2009). "A Randomized Trial of Dialectical Behavior Therapy Versus General Psychiatric Management for Borderline Personality Disorder". American Journal of Psychiatry. 166 (12): 1365–1374. doi:10.1176/appi.ajp.2009.09010039. PMID 19755574. ^ Lynch, Thomas (January–February 2003). "Dialectical Behavior Therapy for Depressed Older Adults: A Randomized Pilot Study". The American Journal of Geriatric Psychiatry. 11 (1): 33–45. doi:10.1097/00019442-200301000-00006. PMID 12527538. ^ a b c Heide, F. Jackie June ter; Mooren, Trudy M.; Kleber, Rolf J. (2016-02-12). "Complex PTSD and phased treatment in refugees: a debate piece". European Journal of Psychotraumatology. 7 (1): 28687. doi:10.3402/ejpt.v7.28687. ISSN 2000-8198. PMC 4756628. PMID 26886486. ^ Bryant, Richard A. (August 2010). "The Complexity of Complex PTSD". American Journal of Psychiatry. 167 (8): 879–881. doi:10.1176/appi.ajp.2010.10040606. ISSN 0002-953X. PMID 20693462. ^ a b Olson-Morrison, Debra (2017). "Integrative play therapy with adults with complex trauma: A developmentally-informed approach". International Journal of Play Therapy. 26 (3): 172–183. doi:10.1037/pla0000036. ISSN 1939-0629. ^ a b Maercker, Andreas; Hecker, Tobias; Augsburger, Mareike; Kliem, Sören (January 2018). "ICD-11 Prevalence Rates of Posttraumatic Stress Disorder and Complex Posttraumatic Stress Disorder in a German Nationwide Sample". The Journal of Nervous and Mental Disease. 206 (4): 270–276. doi:10.1097/nmd.0000000000000790. ISSN 0022-3018. PMID 29377849. ^ a b c Lawson, David M. (2017-06-21). "Treating Adults With Complex Trauma: An Evidence-Based Case Study". Journal of Counseling & Development. 95 (3): 288–298. doi:10.1002/jcad.12143. ISSN 0748-9633. ^ a b c d Ford, Julian D; Courtois, Christine A (2014). "Complex PTSD, affect dysregulation, and borderline personality disorder". Borderline Personality Disorder and Emotion Dysregulation. 1 (1): 9. doi:10.1186/2051-6673-1-9. ISSN 2051-6673. PMC 4579513. PMID 26401293. ^ Fasulo, Samuel J.; Ball, Joanna M.; Jurkovic, Gregory J.; Miller, Alec L. (April 2015). "Towards the Development of an Effective Working Alliance: The Application of DBT Validation and Stylistic Strategies in the Adaptation of a Manualized Complex Trauma Group Treatment Program for Adolescents in Long-Term Detention". American Journal of Psychotherapy. 69 (2): 219–239. doi:10.1176/appi.psychotherapy.2015.69.2.219. ISSN 0002-9564. PMID 26160624. ^ a b Krysinska, Karolina; Lester, David (2010-01-29). "Post-Traumatic Stress Disorder and Suicide Risk: A Systematic Review". Archives of Suicide Research. 14 (1): 1–23. doi:10.1080/13811110903478997. ISSN 1381-1118. PMID 20112140. ^ a b Landes, Sara J.; Garovoy, Natara D.; Burkman, Kristine M. (2013-03-25). "Treating Complex Trauma Among Veterans: Three Stage-Based Treatment Models". Journal of Clinical Psychology. 69 (5): 523–533. doi:10.1002/jclp.21988. ISSN 0021-9762. PMID 23529776. ^ a b c d Meyers, Laura; Voller, Emily K.; McCallum, Ethan B.; Thuras, Paul; Shallcross, Sandra; Velasquez, Tina; Meis, Laura (2017-03-22). "Treating Veterans With PTSD and Borderline Personality Symptoms in a 12-Week Intensive Outpatient Setting: Findings From a Pilot Program". Journal of Traumatic Stress. 30 (2): 178–181. doi:10.1002/jts.22174. ISSN 0894-9867. PMID 28329406. ^ a b Steil, Regina; Dittmann, Clara; Müller-Engelmann, Meike; Dyer, Anne; Maasch, Anne-Marie; Priebe, Kathlen (January 2018). "Dialectical behaviour therapy for posttraumatic stress disorder related to childhood sexual abuse: a pilot study in an outpatient treatment setting". European Journal of Psychotraumatology. 9 (1): 1423832. doi:10.1080/20008198.2018.1423832. ISSN 2000-8198. PMC 5774406. PMID 29372016. ^ a b Wagner, Amy W.; Rizvi, Shireen L.; Harned, Melanie S. (2007). "Applications of dialectical behavior therapy to the treatment of complex trauma-related problems: When one case formulation does not fit all". Journal of Traumatic Stress. 20 (4): 391–400. doi:10.1002/jts.20268. ISSN 0894-9867. PMID 17721961. ^ a b c Florez, Ivonne Andrea; Bethay, J. Scott (2017-01-13). "Using Adapted Dialectical Behavioral Therapy to Treat Challenging Behaviors, Emotional Dysregulation, and Generalized Anxiety Disorder in an Individual With Mild Intellectual Disability". Clinical Case Studies. 16 (3): 200–215. doi:10.1177/1534650116687073. ISSN 1534-6501. ^ a b Denckla, Christy A.; Bailey, Robert; Jackson, Christie; Tatarakis, John; Chen, Cory K. (November 2015). "A Novel Adaptation of Distress Tolerance Skills Training Among Military Veterans: Outcomes in Suicide-Related Events". Cognitive and Behavioral Practice. 22 (4): 450–457. doi:10.1016/j.cbpra.2014.04.001. ISSN 1077-7229. ^ a b Litt, Lisa (2013-03-26). "Clinical Decision Making in the Treatment of Complex PTSD and Substance Misuse". Journal of Clinical Psychology. 69 (5): 534–542. doi:10.1002/jclp.21989. ISSN 0021-9762. PMID 23533007. Linehan, M.M. ; Comtois, K.A. ; Murray, A.M.; Brown, M.Z. ; Gallop, R.J.; Heard, H.L. ; Korslund, K.E. ; Tutek, D.A. ; Reynolds, S.K. ; Lindenboim, N. (2006). "Two-year randomized controlled trial and follow-up of dialectical behavior therapy vs therapy by experts for suicidal behaviors and borderline personality disorder". Arch Gen Psychiatry. 63 (7): 757–66. doi:10.1001/archpsyc.63.7.757. PMID 16818865. Linehan, M.M. ; Heard, H.L. (1993). ""Impact of treatment accessibility on clinical course of parasuicidal patients": Reply". Archives of General Psychiatry. 50 (2): 157–158. doi:10.1001/archpsyc.1993.01820140083011. Linehan, M.M. ; Tutek, D.A. ; Heard, H.L. ; Armstrong, H.E. (1994). "Interpersonal outcome of cognitive behavioral treatment for chronically suicidal borderline patients". American Journal of Psychiatry. 151 (12): 1771–1776. doi:10.1176/ajp.151.12.1771. PMID 7977884. Linehan, M.M. ; Schmidt, H.; Dimeff, L.A.; Craft, J.C.; Kanter, J.; Comtois, K.A. (1999). "Dialectical behavior therapy for patients with borderline personality disorder and drug-dependence". American Journal on Addiction. 8 (4): 279–292. doi:10.1080/105504999305686. Linehan, M.M. ; Dimeff, L.A.; Reynolds, S.K. ; Comtois, K.A. ; Welch, S.S.; Heagerty, P.; Kivlahan, D.R. (2002). "Dialectical behavior therapy versus comprehensive validation plus 12-step for the treatment of opioid dependent women meeting criteria for borderline personality disorder". Drug and Alcohol Dependence. 67 (1): 13–26. doi:10.1016/s0376-8716(02)00011-x. PMID 12062776. Koons, C.R. ; Robins, C.J. ; Tweed, J.L. ; Lynch, T.R. ; Gonzalez, A.M.; Morse, J.Q. ; Bishop, G.K.; Butterfield, M.I. ; Bastian, L.A. (2001). "Efficacy of dialectical behavior therapy in women veterans with borderline personality disorder". Behavior Therapy. 32 (2): 371–390. CiteSeerX 10.1.1.453.1646. doi:10.1016/s0005-7894(01)80009-5.
van den Bosch, L.M.C. ; Verheul, R.; Schippers, G.M. ; van den Brink, W. (2002). "Dialectical Behavior Therapy of borderline patients with and without substance use problems: Implementation and long-term effects". Addictive Behaviors. 27 (6): 911–923. doi:10.1016/s0306-4603(02)00293-9. Verheul, R.; van den Bosch, L.M.C. ; Koeter, M.W.J. ; de Ridder, M.A.J. ; Stijnen, T.; van den Brink, W. (2003). "Dialectical behaviour therapy for women with borderline personality disorder: 12-month, randomised clinical trial in the Netherlands". British Journal of Psychiatry. 182 (2): 135–140. doi:10.1192/bjp.182.2.135. Amy Lopez LCSW, Cheryl A. Chessick MD. (2013) DBT Graduate Group Pilot Study: A Model to Generalize Skills to Create a “Life Worth Living”. Social Work in Mental Health 11:2, pages 141-153. The Miracle of Mindfulness by Thích Nhất Hạnh. ISBN 0-8070-1239-4.